COMMERCE, Calif. and SAN FRANCISCO, Aug. 30, 2017 /PRNewswire/ -- Smart & Final Stores, Inc. (NYSE: SFS), the neighborhood warehouse grocery store, has launched its own delivery platform at shop.smartandfinal.com Powered by Instacart, the technology-driven, nationwide on-demand grocery delivery service. The e-commerce website is part of a renewed collaboration between Smart & Final and Instacart, who announced today they have signed an expanded partnership contract. Smart & Final and Instacart first joined forces to bring same-day grocery delivery to customers in March 2015. 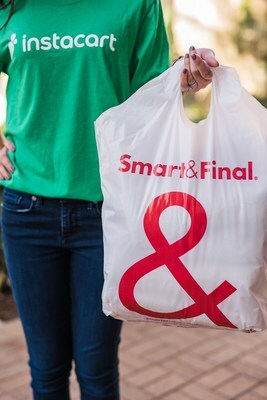 Based on the strong, consistent results – including 15 times sales growth since that initial collaboration – Smart & Final is doubling down on the partnership, giving customers the option to pair the club store's everyday low prices and farmer's market freshness as experienced in-store with the added convenience of delivery straight to customers' doorsteps. "There's no question that there is an increasing emphasis on online ordering and delivery in the grocery space, as today's customer wants and deserves convenience," said Eleanor Hong, Smart & Final's Chief Marketing & Strategy Officer. "Today, over half of our 253 Smart & Final stores offer delivery, both for household and business customers, and we continue to expand that reach as far as our partners at Instacart can offer it. We're enthusiastic about delivery, and through our new e-commerce site Powered by Instacart, we can give our online customers a platform to search, explore and order delivery directly from Smart & Final." Smart & Final customers across Arizona, California and Nevada can now visit shop.smartandfinal.com to fill their virtual carts with all their favorite items, from farmer's market fresh produce and quality meats to club-size essentials, and have them delivered same-day, often in as little as an hour. Customers who place orders on the Smart & Final Powered by Instacart site will enjoy the same great everyday low prices that they enjoy when shopping in person, while getting back something truly valuable: time. "Part of Instacart's mission to partner with the best retailers across the nation is the commitment to provide them with the best e-commerce experience," said Nilam Ganenthiran, Instacart's Chief Business Officer. "We are thrilled to extend our partnership with a premier quality brand like Smart & Final and continue the success we are seeing with value grocers on the Instacart platform." Instacart helps people cross grocery shopping off their to-do lists with just a few clicks. Customers use the Instacart website or app to fill their virtual shopping cart with items from their favorite, local stores and Instacart connects them with shoppers who hand pick the items and deliver them straight to their door. Founded in San Francisco in 2012, Instacart has quickly scaled to over 110 markets nationwide and partnered with retailers across the United States, including popular national chains as well as local, regional grocers. By combining a personal touch with cutting-edge technology, Instacart offers customers a simple solution to save time and eat fresh food from the most trusted grocery brands. Instacart is the only grocery service that can meet today's on-demand lifestyle by delivering in as little as one hour. First delivery is free at www.instacart.com.